SoccerXpert.com is an easy to use online soccer coaching resource. Our Xperts are here to help novice and advanced soccer coaches plan their teams soccer practices, and to aid the soccer coach in the planning and organization of their teams training sessions. SoccerXpert.com includes age-specific games and activities to enhance the development of young soccer players. SoccerXpert.com offers a compilation of soccer drills for every level. You've taken a step most soccer coaches never do—you're proactively involved in becoming a more effective coach. 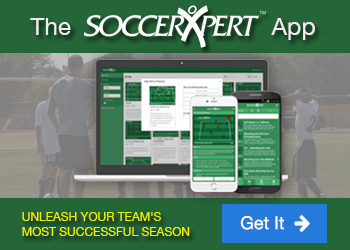 SoccerXpert.com is a powerful resource, which helps coaches plan practice sessions in seconds. It is important to understand the difference between an organized training session and a training session made up on the fly. Have you ever planned practice in the car on your way to practice? Ever planned the practice while you were running the practice, not knowing what was next? Do you ever feel like you do the same boring drills week in and week out and they are getting too repetitive? I think most of us can answer yes to most of these questions every once in a while. When we do have time to plan, we wrack our brains trying to create drills or searching the web for the possibility of stumbling across a good drill that applies to the topic you are trying to teach. As you know, all of that surfing is time, and time is money. On the other hand, the practices you have time to plan typically has a better flow. You are in and out and you are able to keep things moving. When the training session is over, you feel good about what you have done and you have a feeling of accomplishment. The bottom line is, when you are prepared, everyone knows. And when you aren’t prepared, everyone knows. With SoccerXpert.com, you can create practices within seconds, print the plan, and be prepared. Use your free time reviewing the plan in your head, making mental notes rather than having to build the practice from the ground up. Whether you are a novice or beginner, you will benefit from SoccerXpert.com.